This book was okay. Not great, not terrible. It was a very quick read -- I finished it in maybe a couple of brief commutes around town and one lounging-on-couch-eating-pizza session. All of the stories are incredibly short, with some clocking in at just a few pages long, so it is easy to just devour the book in one sitting. As an adult, I found the stories in here to be lacking. They were all sort of predictable and although they were gruesome at times, I didn't find them to be too shocking. I didn't find them to be scary, although a few of them had plot twists that made me go "hm". However, this is probably most likely a case of me just not being the target audience, as I think I would have loved this book as a tween/teenager. I was a big fan of Goosebumps and Fear Street and anything Christopher Pike. Sure, I read the occasional Babysitters Club or Sweet Valley High novel, but I never connected with them in the same way that I loved horror stories. 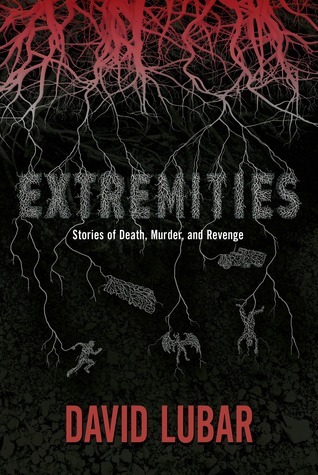 Extremities would have been right up my alley -- creepy and violent enough to my teenage mind to keep me up at night, most definitely. With the stories being so short, you don't often get a chance to know any of the characters before something horrible befalls someone. The stories function more as vignettes, for the most part: set up the scene, drop in some foreshadowing, and bam, horrible deaths. Some of my favorites of the stories included "Apparent Motives", about a teenage boy and what he says is the impending divorce of his parents; "Blood Magic", about a robbery gone wrong; "A Cart Full of Junk", about some thugs and an apparently homeless man; and "The Ex Box", about a girl starting a new relationship. While the book is marketed as Lubar's first book for teen audiences -- his other writings have been for the middle grade and younger set -- the tone of the writing still felt very young to me. Maybe due to the violence and a few stories that involve slightly sexual situations (nothing too bad that I can recall, just some making out and talking about how hot a girl is), this would be better for teens, but I think it could still be appropriate for younger-but-mature readers, maybe those just past middle grade reading.